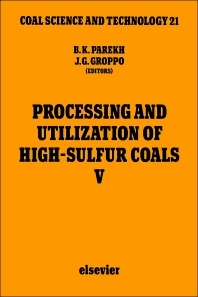 Proceedings of the Fifth International Conference on Processing and Utilization of High-Sulfur Coals, October 25-28, 1993, Lexington, Kentucky, U.S.A.
Due to limitations of space only a selection of papers is listed here. Part I. Characterization of High-Sulfur Coals (4 papers). Further sulfur speciation studies by sulfur K-edge Xanes spectroscopy (G.P. Huffman, N. Shah, F.E. Huggins, F. Lu, J. Zhao). Part II. Coal Desulfurization: Physical (15 papers). Electrochemical equilibria in coal flotation systems and their role in determining the interfacial properties of pyrite and its separation from coal (D. Liu, P. Somasundaran, P.F. Duby). The interaction of thioglycolic acid and pyrite (S. Luo, J.F. McClelland, T.D. Wheelock). On the native and induced floatability of coal and pyrite (C. Jiang, X.H. Wang, J.W. Leonard, B.K. Parekh). Part III. Coal Desulfurization: Chemical and Biological (8 papers). Chemical desulfurization of Canadian high sulfur coal with potassium permanganate (Y.A. Attia, A. Fung). Isolation and kinetic analyses of bacterial strains which desulfurize model compounds characteristic of coal (P. Wang, A.E. Humphrey, S. Krawiec). Part IV. Combustion (6 papers). Characterization of fluidized bed combustion fly ashes produced from high sulfur coals (S.S. Akhtar, S.M. Schlorholtz). Mild tempeature fluidized bed gasification of coal/phosphoric acid mixtures: Partitioning coal sulfur to the gas as H2S (J.M. Stencel, J.K. Neathery, J.L. Schaefer, J. Yang). Formation of NOx and N2O in the fluidized-bed combustion of high- and low-rank coals (B.C. Young, M.D. Mann, M.E. Collings). Part V. Postcombustion Technologies (5 papers). Efficient and cost effective NOx and SO2 removal from flue gases with SNOX™ process (D.C. Borio, W.H. Kingston). Capture of greenhouse gases by novel aerogel sorbents prepared by sol-gel technology (Y.A. Attia). Part VI. Coal Desulfurization: Miscellaneous (7 papers). Spent seed regeneration in coal-fired MHD system using weak-base anion-exchange resins (A.C. Sheth, S.D. Strevel). Microstructural characterization of morphological changes and grain-boundary fractures in coal comminution (Q. Guo, X.H. Wang, B.K. Parekh). Author index. Subject index. Utilization of high sulfur coals is becoming increasingly difficult in view of tighter environmental regulations being imposed around the world. To meet the challenge of utilizing high sulfur coals without damaging the environment, many scientists and engineers around the world are engaged in developing novel technologies. In the U.S.A. alone, the federal government has spent about five billion dollars to achieve that goal. This conference, like its predecessors, emphasizes desulfurization with papers on physical and chemical cleaning as well as post-treatment and fluid-bed combustion technologies. Of the 45 papers submitted, 15 papers deal with physical cleaning and 7 deal with chemical cleaning of coal, suggesting that a major emphasis is still be placed on pre-cleaning of coal. The post-treatment technologies, being developed with the support of U.S. federal and state government agencies, emphasize removal of both SOx and NOx gases. The book will be of particular interest and benefit to researchers, graduate students and other people involved in coal processing, characterization and utilization; public policy making and administration related to energy conservation, economic development, and environmental protection; and investors in industry and new technology.